The 7 essential steps to success. 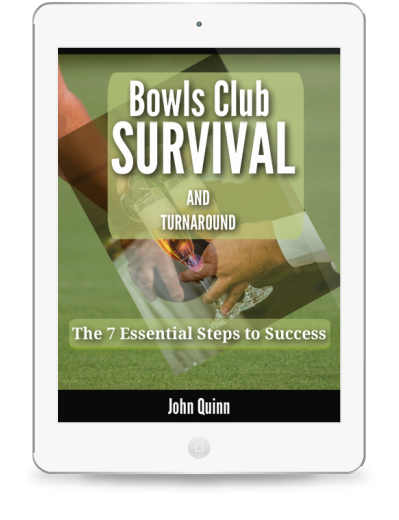 Our much anticipated new eBook Bowling Club Survival and Turnaround, is now available for Instant Download. In this ebook we take you through a groundbreaking, step by step blueprint to save your struggling bowling club and reveal the 7 key steps that you can start taking immediately to start making a serious go of your club. Right now, this is the definitive guide to saving your club and moving on to success you previously only dreamed of. How to stem the flow of cash out of your club starting today and how to prime a pump that will see more cash flowing into your club effortlessly. The remarkable 10 Minute MBA or how to build a business model that works for your club. An amazingly simple but powerful formula that will ensure your club stands head and shoulders above all of your competition. In a revolutionary take on the Marketing of your rejuventated club we turn the commonly accepted view and perceived “wisdom” about Marketing firmly on its head! In this remarkable section we demonstrate “paint by numbers” instructions for achieving all of the members you want with a vastly reduced Marketing budget. Step 5 provides what can only be described as ABC style instructions and guidance to turn your club into a smooth, efficient and profitable machine. In step 6 you’ll discover a remarkable system for adding 20-30% of your current income straight onto your bottom line profit!…by dealing with waste in your club. “Step 7 is essentially a method for bringing all of the previous steps together into an automatic club improvement system. Even after you’ve applied the first 6 steps and have a thriving, profitable club; this step pretty much guarantees that even a very efficient club will improve bottom line performance by at least 10% every 3 months”. So as you can see, ‘Bowling Club Survival and Turnaround, is set to be a very important resource for Bowling Clubs everywhere, but what we’ve told you so far really is just scratching the surface. The book is also packed with actual tools you can use to achieve the remarkable changes previously outlined.